Stunning cultural displays, night tours, and performances await. Suwon Culture Night amplifies the beauty of Suwon Hwaseong Fortress, which is a UNESCO cultural heritage site. 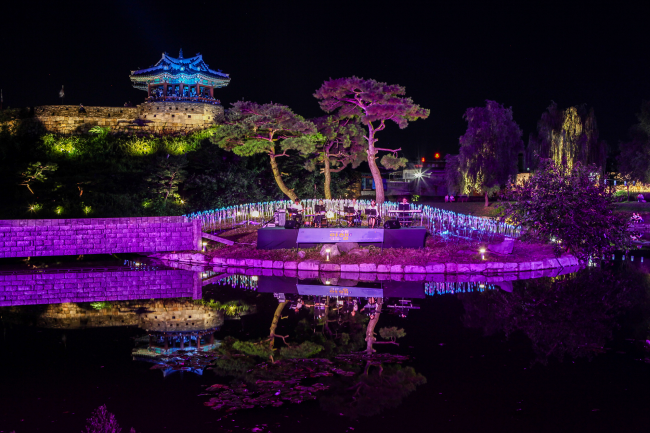 Visitors will be able to enjoy the magnificently lit Hwaesong Fortress Trail, Hwahongmun Gate, Banghwa Suryujeong Pavilion, and Suwon Intangible Heritage Center. The event's official theme for 2018 is “Fortress City Embraced by Moonlight”. The second round of Suwon Culture Night will be held on September 7-8, 2018. Following the success of the first part of this year's Suwon Culture Night (held in August), a second round will be held on September 7-8, 2018 to put focus on the history and charm of Hwaesong Fortress Trail, Hwahongmun Gate, Banghwa Suryujeong Pavilion, and Suwon Intangible Heritage Center. With the theme Fortress City Embraced by Moonlight, visitors will appreciate the stunning display of the historical attractions as well as night performances, meals, and tours. Last year's run of Suwon Culture Night drew over 192,000 visitors. According to the introductory text from Suwon Cultural Foundation, the Suwon Hwaseong castle was completed in September 1796 and became a symbol of political thought that aimed to eradicate "sectarian politics and the realization of a strong kingdom politics. " Paldalmun (Paldal Gate) - name derived from the word 'Sadongseoldaal,' which means that the gate gives you access to every place. Namsumun - water gate made in the point where Suwon Stream flows down south from Hwahongmoon and meets the castle again. To get to Suwon Culture Night's event location, you can view the transportation options here. As noted by the Korea Tourism Organization, ticket information for 2018's event will be available on Suwon Cultural Foundation's website later this August. Visit the site here. If your goal is to immerse in Korea's history and culture, you may also want to purchase a Discover Seoul Pass, which would let you in to more than 30 attractions in Seoul. Click here to read our guide. For more updates and travel guides, like our page on Facebook.